It’s the last Thursday in December, which means it’s time for your free January 2019 desktop wallpapers! This month’s wallpaper was entirely created in Procreate, with just the dates added in using Photoshop and my font, Miss Magnolia. This month, I wanted to go for a soft, wintery ombré feel to ring in the new year. All of the doodles were made using the default ‘chalk’ brush in Procreate (found in the calligraphy brush tab). For the dates, ‘R’ is for Thursday, to distinguish it from a same-sized Tuesday ‘T’ at a glance. The download includes the January 2019 desktop wallpapers in two common resolutions: 1280x1024px and 1920x1080px, with and without dates. I’ve left the year off of the ‘no-dates’ versions, so you can use it for any January in the future, too! We’re continuing the winter watercolor stationery theme this week with another holiday tutorial! If you missed the holiday postcard a couple weeks ago, be sure to check out this post! This week, we’re creating winter watercolor gift tags in Illustrator and we’ll once again be using watercolor elements from the free mini kit (download it below!) as well as the full kit. If you’re looking for more Illustrator gift tags tutorials, I’ve got you covered here, too 😉 Read on for how we create these winter watercolor ones! It’s the last Thursday in November, which means it’s time for your free December 2018 desktop wallpapers! This month’s wallpaper was entirely created in Procreate, with just the dates added in using Photoshop and my font, Miss Magnolia. I decided to change things up and create some reverse/negative space lettering this month surrounded by holiday doodles. All of the doodles were made with my custom monoweight procreate brush, which is available for free in the Every-Tuesday Resource Library. The gold and silver textures are from my Procreate Metallic Kit, available here. For the dates, ‘R’ is for Thursday, to distinguish it from a same-sized Tuesday ‘T’ at a glance. The download includes the December 2018 desktop wallpapers in two common resolutions: 1280x1024px and 1920x1080px, with and without dates. I’ve left the year off of the ‘no-dates’ versions, so you can use it for any December in the future, too! One major change that came with Procreate’s last update was masking. It might not have seemed major if you aren’t familiar with masking, but it was actually a bigger deal than it probably got credit for. Masking essentially allows for a non-destructive workflow. What that means, is instead of erasing something you don’t need, then having to draw it back in if you change your mind, masking ‘hides’ the part you don’t want and you can bring back the original easily at any time. Pretty nice. You can check out how awesome masking is in Photoshop here and it actually works pretty similarly in Procreate. 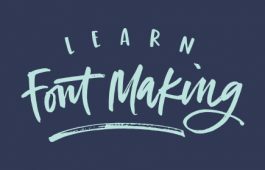 In this week’s tutorial, I’ll take you through the two most common lettering scenarios where I use masking in Procreate. Once you begin masking, you’ll see the immediate advantages and how much faster (and efficient) it makes creating and editing. It’s the last Thursday in October, which means it’s time for your free November 2018 desktop wallpapers! 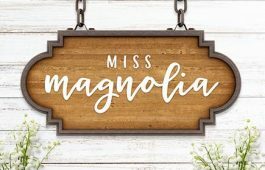 This month’s wallpaper was entirely created in Procreate, with just the dates added in using Photoshop and my font, Miss Magnolia. I created the ribbon you see following the exact steps from this Procreate tutorial. 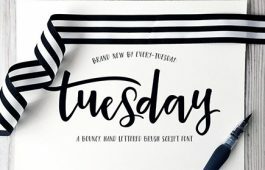 All of the details, including the lettering were made with my custom monoweight procreate brush, which is available for free in the Every-Tuesday Resource Library. The texture shading was added using the default chalk brush in the calligraphy tab in Procreate. For the dates, ‘R’ is for Thursday, to distinguish it from a same-sized Tuesday ‘T’ at a glance. The download includes the November 2018 desktop wallpapers in two common resolutions: 1280x1024px and 1920x1080px, with and without dates. I’ve left the year off of the ‘no-dates’ versions, so you can use it for any November in the future, too! After I created this tutorial, I received a few questions about how to create pattern brushes with corners in Illustrator. If you ever need your pattern brush applied to a 90º angle, you’ll need to implement custom corners. Here’s the kicker, though; Illustrator CC makes corners super easy when the pattern brush is geometric. When your pattern brush is hand drawn, there are extra considerations to make, so we’re covering them all in this week’s tutorial. Read on to create hand drawn pattern brushes with corners! Happy Tuesday! This week, we’re heading back to Adobe Illustrator for a fun beginner-style tutorial! We’ll create a vector coffee icon using simple shapes and add some depth with a flat design and an easy color palette. If you’ve never used Illustrator before or are just getting familiar with it, this is the perfect tutorial to get some basics down. 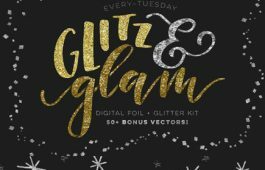 At the end, you’ll have an infinitely rescalable vector icon you can use for web design, print work or to post to your social media accounts. Read on to see it all! 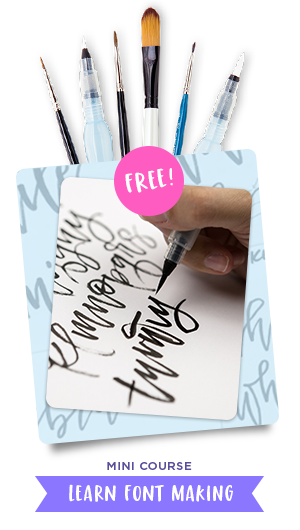 Many of you likely know I teach a comprehensive course on creating and selling hand lettered fonts (check it out here!). The course reopens next week for the last time this year, so if you plan to get started, I thought some lettering supply recommendations were in order!